Holy God, in this world, it does not always make sense to proclaim the good news that You save. How can the people of Syria recognize the glory and strength of the Lord through the noise of gunfire and shelling? How can the hundreds of millions of hungry people around the globe hear of your glorious deeds over the roaring of their empty stomachs? Father, Remind us of the scope of your redemption. Remind us that you are the Lord who reigns, who is coming to judge the world with justice and the nations with truth. Holy Spirit, make us into a people who take this good news to all the families of the earth by our words and our actions. Remind us, Father, that, because of your victory in Jesus, we can sing a new song in the midst of this world. Fill us with that hope. May we be like the seas that roar, despite the pollutants poured into them; the trees that rustle with praise to you, in the face of massive deforestation; and the animals that dance before you, though their ecosystems are wrecked, sometimes beyond recovery. Holy Spirit, make us into a people who rejoice and are glad with all creation before the Lord who comes to set everything right on earth, to consummate the Kingdom inaugurated in Jesus Christ. Make us into a people who join in that work throughout the earth now—for in this Lord, our work is surely not in vain. I wonder about how Christians should read and interpret the Bible more than just about anything else. It might seem straightforward enough at a glance, but only at a glance. Why do we tend to take Jesus so seriously on, say, praying the Lord's Prayer, but not so seriously on 'hate your father and mother'? Who gets to decide that he 'doesn't really mean' the one but not the other? How is 1 Chronicles 1-9 useful for teaching, reproof, correction, and training in righteousness? I mean, really. What do you do with Genesis 1-2, when so many people want you to read it in so many different ways? The list could go on and on. 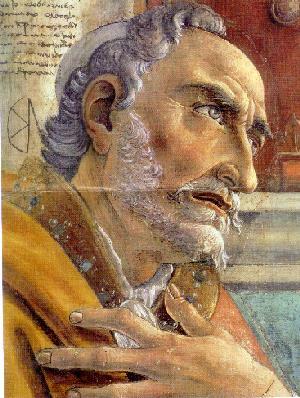 I thought I'd share one of my favorite words from Saint Augustine of Hippo--something that has proven true in all of this, no matter what else might trip me up. This comes from his classic work On Christian Doctrine, which is, for the most part, an exploration of the methods of interpreting scripture. While there's much more to Augustine's interpretive practices, I've always thought this was a particularly beautiful comment, and it is, if not comprehensive, certainly important to this Church Father. Whoever, therefore, thinks that he understands the divine Scriptures or any part of them so that it does not build the double love of God and of our neighbor does not understand it at all. Last fall I had some free time and decided to finally read something by the infamous Bart Ehrman. If people in churches are reading this controversial biblical scholar, then I suppose I ought to be reading him too. After all, I want to know what rubbish people are being fed by popular authors and to prepare to counter it. So I went to the library and picked up Misquoting Jesus: The Story Behind Who Changed the Bible and Why. As it turns out, though, most of Misquoting Jesus is far from rubbish. For the most part, this book is just a history of the study of biblical manuscripts--and a very accessible and informative history, at that. At this point you might be wondering what we talking about when we say 'biblical manuscripts'? That's a good question (and another great help of Ehrman's book is how deftly and plainly he describes all of this). Well, the books of the New Testament were written in Greek almost two thousand years ago. Early Christians soon started making copies of these books, and then copies of the copies, and so on. Eventually the originals were lost, and today we are left with various of the (still very, very old) Greek copies of the texts. We also have many ancient copies in other languages, like Latin, from when early Christians who didn't know Greek wanted to get their hands on the gospels, Paul's letters, etc. All of these old copies are our ancient biblical 'manuscripts'. However, because these texts were hand copied over and over for centuries, the manuscripts that we have today often disagree with each other, on a word here or some spelling there. (You'll see footnotes about some of these disagreements in your Bible: "Other ancient authorities read..." and that sort of thing.) Because of all of these differences in the manuscripts, Bible scholars often have to decide between different readings of a verse--have to decide which version from the manuscripts they think is closest to what was originally written by the biblical author--and they have lots of rules set in place to try and help them make good decisions here. Ehrman's book, then, is about the adventures (and misadventures) in the history of these manuscripts--people finding them, trying to make decisions about them, changing them, etc. Maybe an example can help show the importance of this sort of thing for Christians today. These verses are often called the "Johannine Comma." It may surprise many folks that these verses have quite a history. Ehrman retells it well, and his account gives us a nice glimpse of the issues and history that can lie behind the scriptures. In the 1500s, Erasmus of Rotterdam set about making the first critical text of the Greek New Testament ever published. 'Critical text' here simply means that Erasmus gathered up multiple Greek manuscripts and compared them; where there were differences between the manuscripts, he tried to decide which version was most likely the original. However, when Erasmus reached 1 John 5:7-8 in his work, there was a problem: these verses didn't appear in any of his Greek manuscripts. They were to be found only in the popular Latin versions of the New Testament. So, naturally, Erasmus omitted them. This caused quite a stir: after all, this man had just cut out some words from the Bible! As the story goes, Erasmus... agreed that he would insert the verse in a future edition of his Greek New Testament on one condition: that his opponents produce a Greek manuscript in which the verse could be found (finding it in Latin manuscripts was not enough). And so a Greek manuscript was produced. In fact, it was produced for the occasion. It appears that someone copied out the Greek text of the Epistles, and when he came to the passage in question, he translated the Latin text in Greek, giving the Johannine Comma in its familiar... form. The manuscript provided to Erasmus, in other words, was a sixteenth-century production, made to order. Despite his misgivings, Erasmus was true to his word and included the Johannine Comma in his next edition, and in all his subsequent editions. As Ehrman points out next, these later editions of Erasmus's would, through a few more steps, go on to form the foundation for the Greek text translated as the King James Version. From 1611 (the date the KJV was created) until the 20th century, English Bibles would include these suspect words. Today, Bible scholars have decided to leave the extra words out, maybe putting them in the footnotes, since it seems like they were not originally a part of 1 John (because none of the oldest and best manuscripts we have include them). Personally, I've never understood the King James-only impulse that so many cling to religiously. After all, it's just a translation; the Bible wasn't written in English in the 17th century. Stories like this just make that impulse much more disturbing. If the King James Bible in all of its elegance is, at times, based on bad manuscripts, then I'll take some other translation over it every time. I'd rather read what John actually wrote--or as close to that as we can get. Before we wrap up, I need to point out one, hugely important thing. Most of the issues in the scriptures that scholars like Ehrman have to deal with, most of the discrepancies in the manuscript evidence, are no where near as significant as what we find in 1 John 5. In fact, as Ehrman himself has to admit, most of the differences found in the manuscripts "are completely insignificant, immaterial, of no real importance for anything other than showing that scribes could not spell or keep focused any better than the rest of us" (207). But just occasionally, as the Johannine Comma shows us, the differences are important. This sort of talk may indeed seem threatening to some Christians. If I were a King James-only believer, I would be pretty upset right now myself. 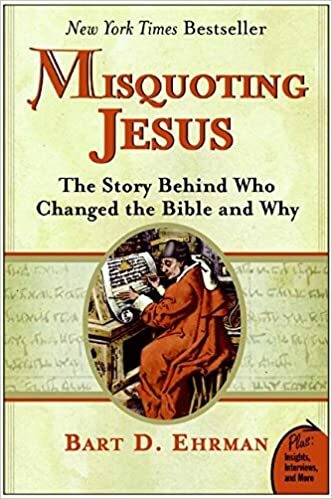 For most of us, however, I think the stories and examples in Misquoting Jesus will simply provide a nice view of a largely unknown world: the history of the text of the scriptures. There is a history; Christians who would not be caught off guard by eloquent despisers of the faith ought to know about it. Ehrman himself was caught off guard, as his introduction tells us, and this shock cost him his faith. Ironically, I think his book--which is probably meant to pull the rug out from others as it was pulled out from under him--offers a nice remedy to this danger. The only real rubbish is found in his discussions, at the very beginning and the very end, of how this shock led him away from Christianity (and why it ought to lead us away too!). If Ehrman had been better served growing up in the Church, if he had developed a more theologically thick, imaginative, and circumspect view of the Bible, this fall would not have taken him down so far. Perhaps now his hard work can help alleviate the tumble for some others. * I say 'explicit and clear' because there are other verses in the New Testament which indicate the triunity of God--for instance, Matt 28:19; 2 Cor 13:13; Eph 2:18--yet any of these, however explicit or clear, is a far cry from "these three are one."